On March 1, 2017, the Maine InfoNet Download Library switched from using the OverDrive platform to the Cloud Library platform to deliver ebooks and audiobooks to library members. I have used Cloud Library before: Camden Public Library has provided its own Cloud Library for several years, and existing users do not need to take any additional steps. You will simply be able to see thousands of new ebook titles, as well as have access to audiobooks (new!). I am new to Cloud Library: If you previously used the Maine InfoNet Download Library through OverDrive platform, please see the updated Cloud Library FAQ section. Get started by downloading the app for your iPad/iPhone, your Android device or your PC/Mac. Placing holds: If the Maine InfoNet Download Library (a consortium of libraries in the state of Maine) and the Camden Public Library have both purchased copies of the same ebook, you will see that 2 copies are listed. If both are checked out, Camden Library members will have priority when placing a hold on that title, moving up in the holds line. Would you like to borrow an iPad? If you have a valid library card and a driver’s license, you can borrow an iPad for 14 days. Then, simply follow the instructions for how to download eBooks and audiobooks to an iPad from the Cloud Library or other resources available on the internet. Please note, all content is erased from the iPad you borrow upon its return to the Camden Public Library and prior to checking it out to the next library member. It is, however, your responsibility to log out of all accounts and delete confidential information from the device. Would you like to borrow a Kindle? 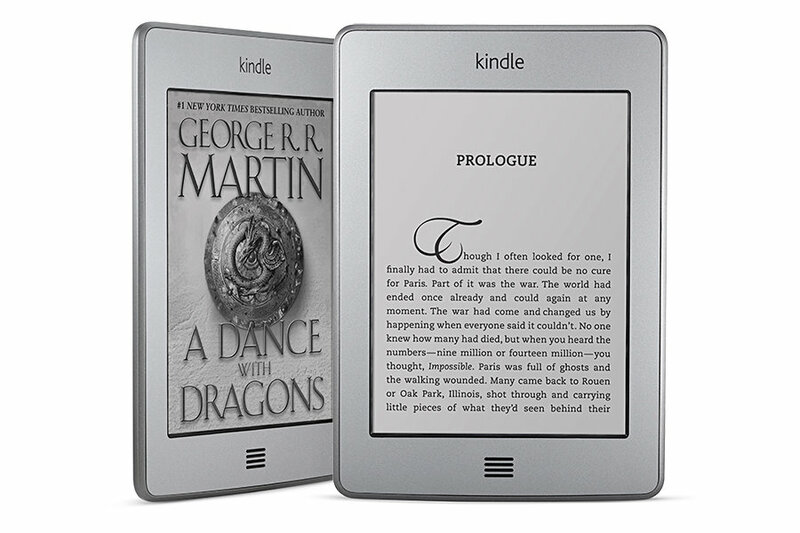 We also lend the e-ink style Kindle and Kindle Touch, all of which come pre-loaded with over 300 books. You can search our catalog as you would for a paper book and you will see if a title is available both as a paper copy and on a Kindle. Please check with the Circulation Desk if you are interested in a specific title. Where do library ebooks come from? Camden Public Library and 140 other Maine libraries joined together to provide the Maine InfoNet Download Library. It’s a collection of several thousand, and growing daily, ebooks and audiobooks which you can borrow free of charge using your library card number. 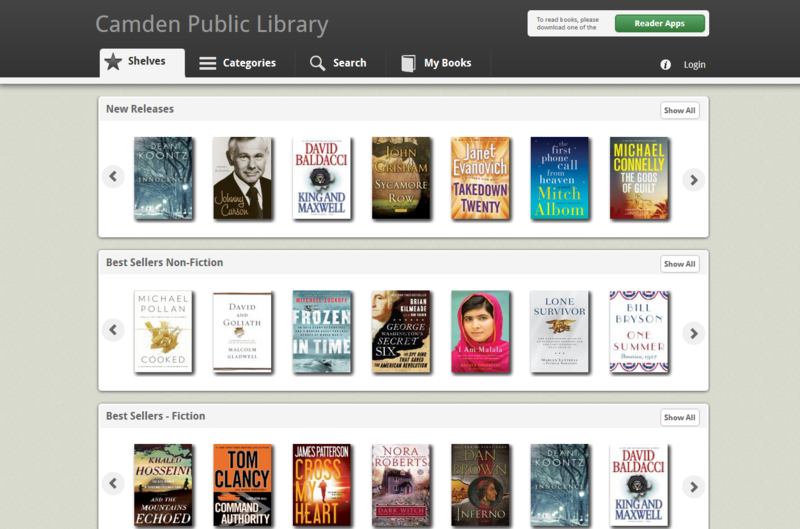 Some Cloud Library titles are purchased directly by the Camden Public Library using Camden Public Library funds. The collection is small, currently about 300 titles (revised March 1, 2017), and features, almost exclusively, best-sellers and high-demand titles. After March 1, 2017, all members of the Maine InfoNet Download Library consortium will have access to these titles. However, Camden Public Library cardholders will have priority in placing holds on these titles. If the book you want to check out is purchased by Camden Public Library and is currently checked out with holds by non-Camden patrons, you can place a hold at any time which will move you to the top of the holds list, thereby granting a shorter waiting time. How many ebooks can I check out? Maximum number of check-outs at one time is 3. Books are checked out for 14 days. Where else can I get free ebooks? Project Gutenberg has many titles available to download for free, primarily non-copyrighted classics.